The Bracket platform M is a site-ready, lightweight working and pro­tection platform that gives a big boost to safety in the field of masonry and pre-cast construction. The winner of an EU award, the Bracket platform M complies with both EN 12811-1 (for use as a working platform), and DIN 4420 (for use as a pro­tection platform). 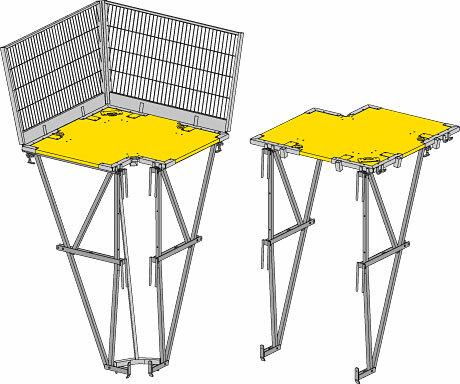 The wide (2.50 m) centre-distance between the brackets means that fewer suspension points are needed. 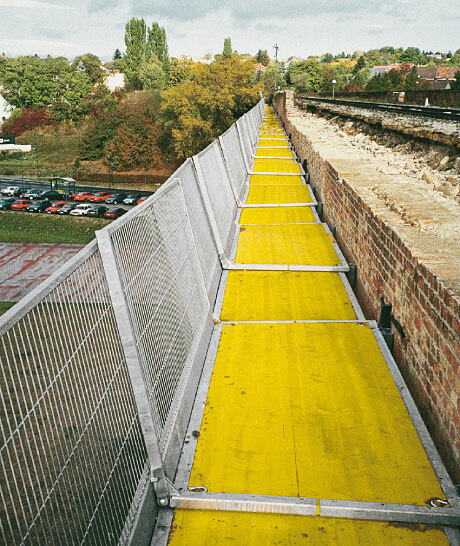 The 3.00 m long platforms can be combined in any way desired, or used on their own for bridging gaps. The Corner platform decking M provides a safe corner transition. 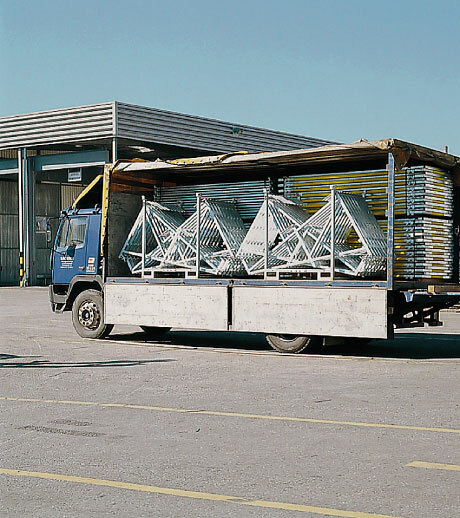 The whole unit can be quickly repositioned in just one crane cycle. This corner solution is a quick and safe way to make outside corners. 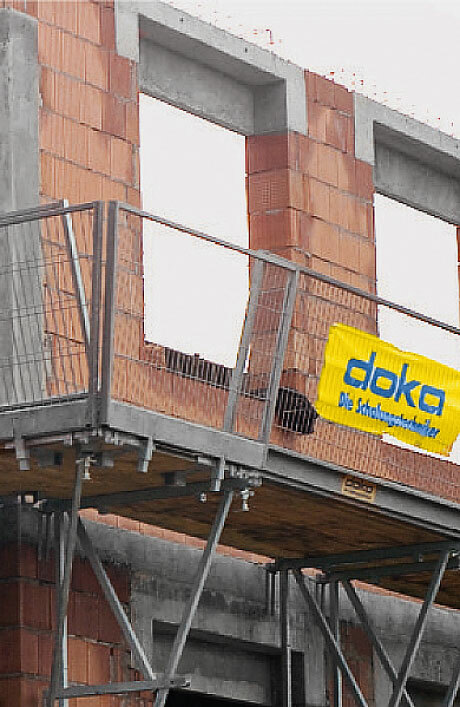 The Doka Suspension loop ES, for loop-type suspension points, complies with the rules of Load Class 4 to EN 12811-1 and DIN 4420. The Platform decking M 3.00m can also be used for bridging openings and for closures, without having to be modified first. 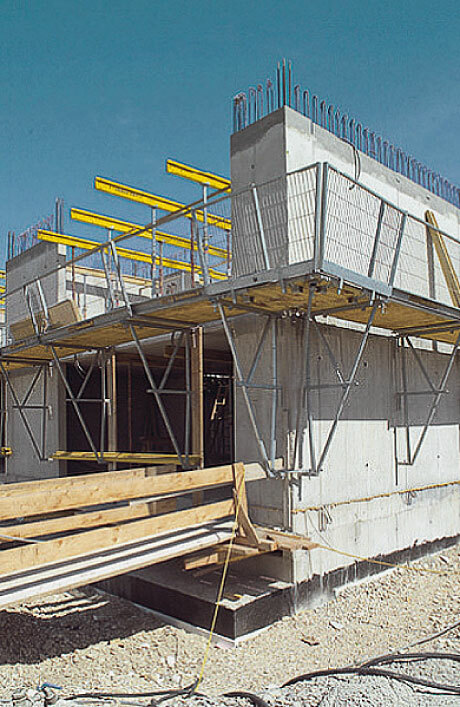 The Universal handrail lengthening piece M extends the operational range of the Bracket platform M so that it provides uninterrupted safety as a rooftop fall barrier. The Precast member head M makes it easy to convert the Bracket platform M into a pouring platform for pre-cast hollow-wall members. 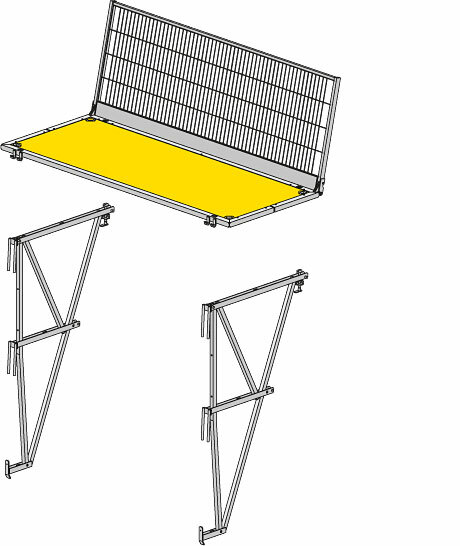 The Bracket platform M cuts costs by being ready for operation in only a few simple steps: Tilt up the railings – fix the bracket – hang the platform into place – that's it. Used as a working platform, e.g. 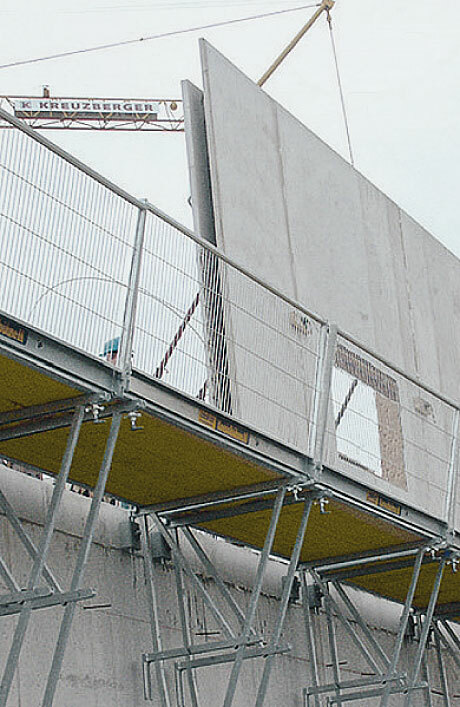 on walls, the Bracket platform M makes for safe working thanks to its spacious width and close-meshed lattice railings. DIN 4420 and ÖNORM B 4007 compliant protection platform. 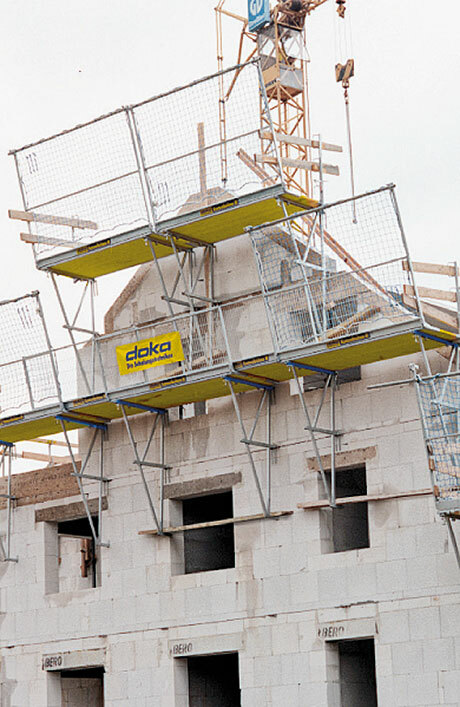 The Doka bracket platform M puts an end to the time-consuming and risky business of improvising protection platforms from separate brackets and planks. Combined with safety nets (mesh aperture max. 100 mm) and Universal handrail lengthening pieces M, the Bracket platform M can be used as a dependable sloping-rooftop fall barrier. 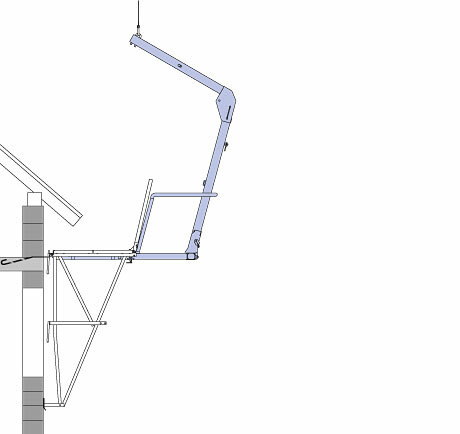 The Bracket platform M has a second drop-in rod on each bracket which enables it to be placed 1.00 m higher, e.g. to comply with regulations regarding the maximum drop distance to protection platforms. The Corner platform decking M is designed so that it can also be used as outside as well as inside corners. 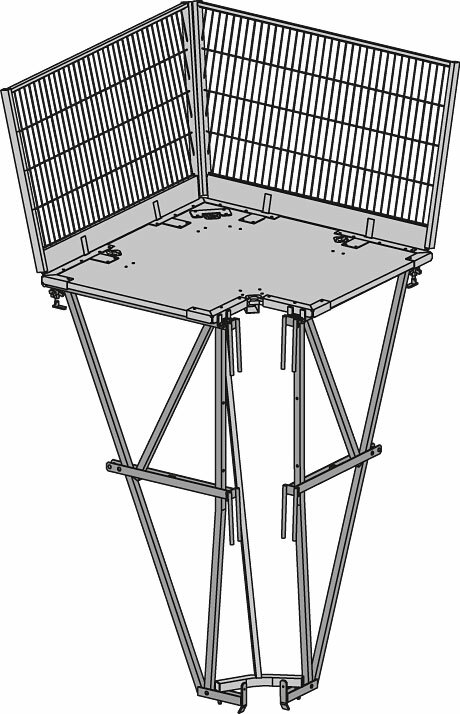 The whole unit can be repositioned in a single crane cycle. This makes it possible to arrange platform layouts very quickly, even in corner zones. For the inside corner the two platform brackets are mounted in parallel with one another. 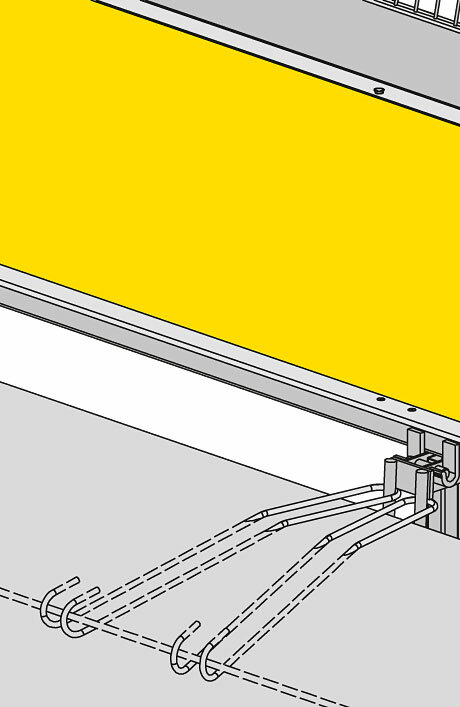 The safe way of mounting and relocating the platform under roof-overhangs. The planking units and platforms are stored and transported separately. This greatly reduces the transport volume and makes such good use of the loading area that 200 lin.m of platforms will fit inside one truck trailer. Thank you for your interest - Bracket platform M.
Thank you very much for your interest - Bracket platform M.